Wondering how to inject a bit of colour into your dreary, winter garden? Well we have a colourful solution. 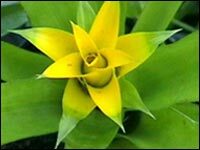 Member of the bromeliad family, the Canistropsis billbergioides come in a number of colourful varieties, which mainly flower from May to September. The eye-catching plants are small to medium sized and grow to about one foot to 18 inches tall. They are identifiable by their large green leaves, showcasing a central, clustered head of colour in showy oranges, pinks or reds. They do best in shady areas so it pays to plant them under trees, or in areas that don't receive a lot of afternoon sun. If you are planting them during winter take note that they get the shade they need so that come summer they are not scorched by the sun. Among our favourites are the 'Citron', 'Persimmon' and 'Tutti Frutti'. The Citron, a bright yellow variety as its name would suggest, is smaller than most varieties. Flowering from May to September, it bears shiny green leaves that are slightly lighter and softer than others. The Citron is perfect as a pot plant. 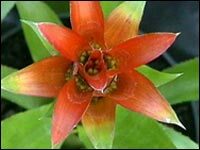 The Persimmon features an unusual star shaped flower with a striking burnt orange colour with slight tinges of green. It remains in colour for up to three months. Again, it is ideal for pot plants, but if outdoors it is best under dense trees, where its flowers appear to shine from the shade. It flowers a little earlier than other varieties  sometimes flowering as early as March. 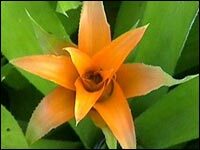 The Tutti Frutti has larger leaves and features one of the more stunning flowers. The dramatic burnt orange flower changes to a deep mulberry read as it ages.